Operating in the 400 MHz and 900 MHz licensed spectrum bands, the Aprisa XE provides industry-leading distance and throughput, with a single link covering in excess of 100 miles, and capacity of up to 1112 kbit/s. The Aprisa XE has second-to-none reliability, with a meantime between failures approaching 100 years, and zero out-of-the-box failures in 2008. Customers in over 100 countries around the world have chosen 4RF, not just because of the unbeatable value and performance of the Aprisa XE, but also because they know they can rely on our comprehensive range of network planning, equipment installation and support services. 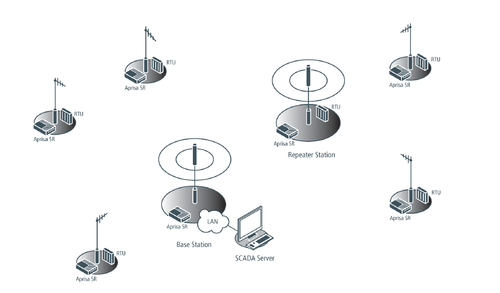 WHY CHOOSE THE APRISA XE POINT-TO-POINT LINK ? Since its inception in 1988, Arya Communications & Electronics Services Pvt. Ltd., has been at the fore front of providing top of the line communication solutions to its diverse customer segments. Today, it offers end-to-end cutting edge solutions in the field of wired and wireless communications, security and surveillance, professional engineering services and emerging technology platforms. An ISO 9001:2008 certified company; Aryacom has been consistently providing reliable and customized turnkey products, solutions and services. Entirely customer centric and technology driven, Aryacom represents the best of global brands that are leaders in their respective business domains to provide the latest and most cost effective solutions tailor made to the requirements of client’s in its chosen segments.